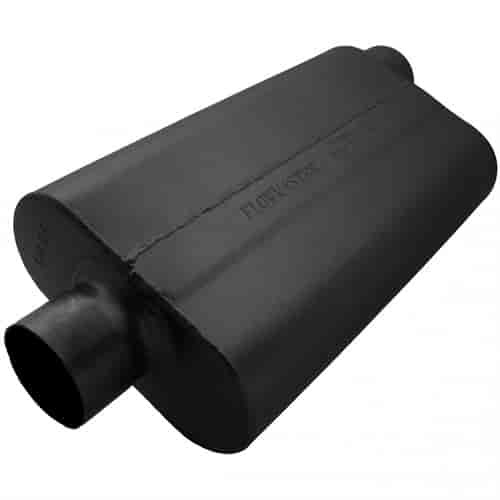 Flowmaster 50 Delta Flow Muffler Center In/Offset Out: 3"
Flowmaster's 50 Series Delta Flow Mufflers are designed to reduce interior sound and resonance, but provide a moderate exterior tone level through advanced technology. The compact exterior case size tailors to passenger cars rather than trucks or SUV’s. Featured with unique Resonance Tuning Chamber, the 3-chamber 50 Series Delta Flow gives the same performance as the 2-chambered Flowmaster mufflers but delivers increased engine efficiency for better power and mileage. Reduced Interior Noise and Resonance. 409S Stainless Steel or Aluminized Steel.